Metal in its natural state is in the form of ore. It requires a great amount of energy to make metal from ore. Metals are actually in a temporary state. That is, at some point, they will revert back to their original state of ore. This may take several years or it could take up to hundreds or even thousands of years. The more energy required to transform an ore to metal, the faster the metal returns to its original state. Corrosion is the natural mechanism by which metal returns to its original state of ore. Corrosion of metal is an electro-chemical process -the flow of electrons from high-energy areas of metal to low energy areas through a solution on the surface of the metal, capable of supporting corrosion. Corrosion will not take place without a conducting solution. The solution is called an electrolyte, caused by water, rain, moisture, and humidity. 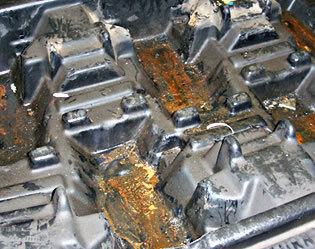 Only a small amount of an electrolyte is needed to cause corrosion. Even 65% relative humidity will form an electrolyte, which can cause corrosion. The high-energy area of a metal is called an anode. This is the area of metal where current leaves to enter an electrolyte. The low energy area is a cathode. Current leaves the electrolyte here and returns to the metal. The number of pairs of cathodes and anodes are specific to each metal. Metals, which have more pairs, are more susceptible to corrosion. For instance, machined metal surfaces have more pairs. In some cases, corrosion can occur within minutes. 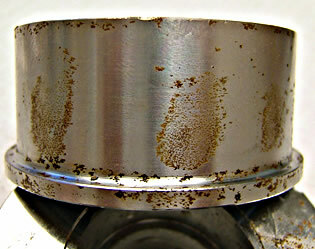 The corrosion process results in the formation of oxidation on a metal surface. If the metal layer is physically sturdy, the corrosion process can be delayed while the layer acts as a buffer between the electrolyte and the metal. If the layer is fragile or porous, the corrosion continues unhindered. For instance, in the comparison of aluminum and steel, aluminum is a high-energy metal. Atmospheric corrosion is slowed considerably, but not permanently. Steel, likewise, is a high-energy metal, however, it is a porous metal and has a fragile oxidation layer. To prevent corrosion, it requires outside assistance. 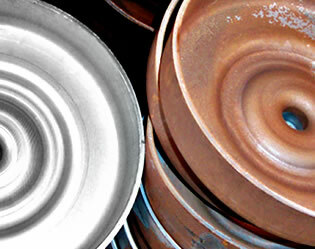 Steel and other ferrous metals rust in various ways and due to several factors. 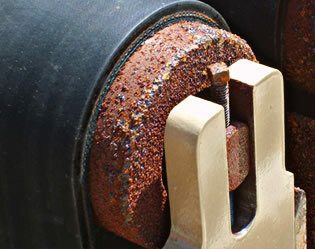 For further information about types of corrosion, visit the Types of Rust page on the site. An inhibitor retards or slows down a reaction. All Armor Protective Packaging® products utilize our proprietary ARMOR VCI nanotechnology. ARMOR VCI (volatile or vapor corrosion inhibitors) decreases the rate of attack on metals. VCI is class of corrosion inhibiting compounds which have sufficient vapor pressure or energy to release molecules from a compound into the air. Once released, the molecules are disseminated throughout an enclosed air space to the metal surface by diffusion, i.e. the normal flow of air caused by rising and falling temperature. ARMOR VCIs retard the corrosive action. Electrical current attempts to flow from the anode through the electrolyte into the cathode but cannot, because of the VCI’s presence. ARMOR VCI molecules passivate the surface and inhibit or depress the electrochemical mechanism that triggers oxidation, i.e. the current flow from anode to cathode. VCI molecules attach themselves to a metal surface to form an invisible, thin film, only a few molecules thick, to protect metal from attack. The volatility of VCI is a convenient way to apply the inhibitor. It is desirable for a VCI to provide the inhibitor rapidly and to have a lasting effect. Therefore, the compound should have a high enough volatility to saturate all the accessible vapor space as quickly as possible. But at the same time, it should not be too volatile because it would be lost rapidly through any leaks in the package or container in which it is used. The optimum vapor pressure of VCI should be just sufficient to maintain an inhibiting concentration on all exposed metal surfaces. The amount of inhibitor molecules emitted by a VCI is a function of temperature of the environment and humidity. As the rate of temperature and humidity rises, so does the rate of corrosive attack on the metal. However, the rate of ARMOR VCI vapor pressure or energy of the inhibitor increases as well, resulting in the release of additional VCI vapor to protect the part. The opposite is also true. 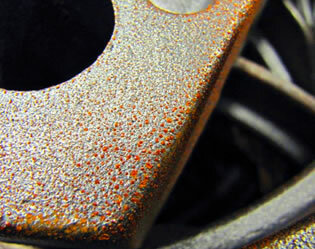 In addition, cutting, milling, polishing, grinding or other processing fluids can actually promote corrosion. Cleaning operations and proper titration of rust inhibiting baths must be conducted at appropriate points along the process. However, these baths are in a continual state of chemical change. Items emerging from a bath will be left with surface residues. Normally, this will not accelerate corrosion, however, unexpected changes in these baths could result in actually increasing the rate of corrosion. The principle cost saving feature of Armor Protective Packaging® VCI products is that it allows metals to be protected in a clean, dry condition over extended periods. There is no need to have physical coatings or the labor costs of application and removal of them. However, not all VCIs’ are the same. Some can actually accelerate the corrosive attack, while others do not work effectively at all. Older metal protection methods actually formed a physical layer. ARMOR VCI Nanotechnology does NOT alter any important metal properties, even in precise electronic applications. Once the ARMOR products are removed, the metal part is ready for immediate use.